A coach/bus clipped a city type All Terrain crane this morning as it overtook it, while heading north on the M11 motorway, near the M-25 in the UK, blocking one lane on the section between junction five and six. The two axle crane – a 20 tonne Kobelco RK200 – owned by Emerson Crane Hire – skidded on the icy road after it was clipped, and overturned onto the verge. 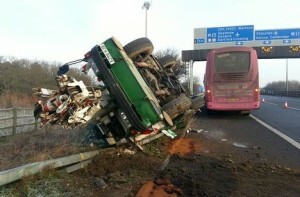 The crane operator – miraculously- was completely unhurt, as were the coach driver and his five passengers. This was though one of the few times that a crane has come off worse in a road accident than the other vehicle. Two hours after the incident however, with the lane closed due to an oil spill, four cars were involved in an incident as they passed the scene. Two women are currently being treated for head and neck injuries. I just want to mention I’m new to blogging and site-building and absolutely loved this web site. Almost certainly I’m want to bookmark your blog post . You definitely come with tremendous well written articles. Appreciate it for sharing with us your web-site.